SAN JOSE, CA--(Marketwire - May 19, 2008) - Cadence Design Systems, Inc. (NASDAQ: CDNS) today announced that $1.045 million was raised at its annual Stars & Strikes® fundraising event and bowling tournament, enabling May Institute to establish a pediatric specialty center to serve children with autism and their families. May Institute, a nationally recognized nonprofit organization that serves children and adults with autism and other developmental disabilities, will work closely with the Silicon Valley Children's Hospital Foundation to develop the center, which will focus on diagnosing and treating autism and other serious developmental disabilities. The specialty center is expected to open by the end of the year on the campus of Good Samaritan Hospital. The number of children diagnosed with autism has been rising steadily. As many as one in 150 children have an autism spectrum disorder. Effective treatments are available, but early diagnosis and intervention services are considered key to a child's long-term success. "The importance of early intervention and treatment for children with these types of disabilities cannot be overstated," said May Institute President and CEO Walter P. Christian, Ph.D., ABPP. "This facility will make a significant difference in the lives of these children and families. May Institute is grateful to the corporate sponsors, organizations, and individuals who have contributed so generously to this event in support of our new center." The 2008 Stars & Strikes fundraising effort was capped off today with the annual bowling tournament, featuring members of the San Francisco 49ers football team and local business and civic leaders, including San Jose Mayor Chuck Reed. The Stars & Strikes bowling tournament has now raised a total of more than $11 million since its inception in 1990. 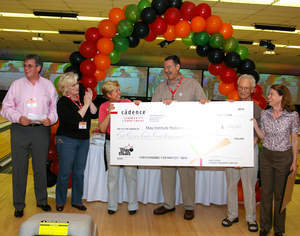 In the weeks leading up to the bowling tournament, Cadence raised over $75,000 through a series of employee-driven fundraising activities, including a talent show and a variety of athletic tournaments. Cadence also underwrote all event expenses. More than 200 bowlers -- including partners and competitors of Cadence -- pledged money to team up with 49ers football players and compete for bowling tournament trophies. The tournament was followed by live and silent auctions of donated items, such as autographed sports memorabilia, vacation getaways and consumer electronics items. The tournament was held at "300 Bowling" in San Jose, which donated its facility for the day's events. In addition to May Institute, the San Francisco 49ers Foundation -- a longtime collaborator with Cadence on Stars & Strikes -- will receive funds from the Stars & Strikes event. The 49ers Foundation provides resources for many outstanding nonprofit organizations in the San Francisco Bay area. "Once again, the local business community and Cadence employees have come through in a big way," said Cadence CEO Mike Fister. "I think all of us involved have welcomed this opportunity to make a real difference in the lives of the children and families who need and deserve our support. Hats off to everyone who helped make this possible." "An event like this helps remind us how special our community is," said San Jose Mayor Chuck Reed. "In the spirit of innovation that is synonymous with Silicon Valley, Cadence and its business partners responded to the urgent need for diagnostic and treatment services for autism, and helped raise the needed funds for a pediatric specialty center. I look forward to the ceremony when the new center opens." Cadence enables global electronic-design innovation and plays an essential role in the creation of today's integrated circuits and electronics. Customers use Cadence software and hardware, methodologies, and services to design and verify advanced semiconductors, consumer electronics, networking and telecommunications equipment, and computer systems. Cadence reported 2007 revenues of approximately $1.6 billion, and has approximately 5,100 employees. The company is headquartered in San Jose, Calif., with sales offices, design centers, and research facilities around the world to serve the global electronics industry. More information about the company, its products, and services is available at www.cadence.com. May Institute is a nonprofit organization that provides educational, rehabilitative, and behavioral healthcare services to individuals with autism and other developmental disabilities, brain injury, mental illness, and other behavioral healthcare needs. Since its founding over 50 years ago, May Institute has evolved into an award-winning national network that serves over 25,000 individuals and their families annually. With corporate headquarters in Randolph, Massachusetts, the Institute has more than 200 service locations in the Northeast, Mid-Atlantic, Southeast, Midwest, and on the West Coast. The Institute operates several nonpublic schools for children with autism and other developmental disabilities, including The Bay School in Santa Cruz, which is dedicated to providing education and intervention services to students, birth and age 21, and their families. For more information about May Institute, go to www.mayinstitute.org. Cadence, is a registered trademark, and the Cadence logo is a trademark of Cadence Design Systems, Inc. in the United States and other countries. All other trademarks are the property of their respective owners.